If there is one thing that indie developers are renown for, it is combining elements from two different games to create something new, unique, and in most cases, exciting. 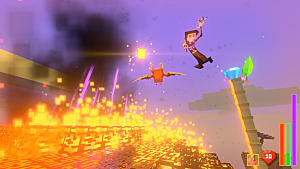 One such game that that falls into this category is Rogue Islands, which combines Minecraft's graphics and game mechanics (such as crafting and mining) with Ziggurat's fast-paced FPS action to create something different and fun. 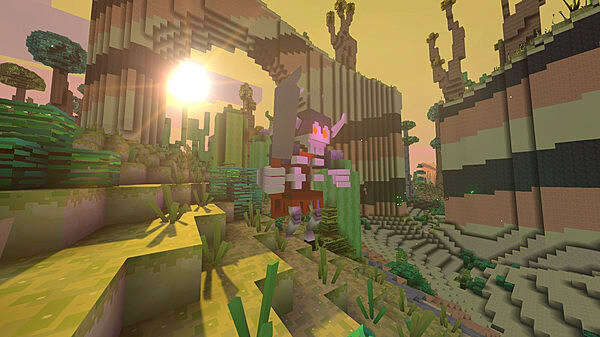 Essentially, Rogue Islands is an FPS roguelike developed by Big Fat Alien. 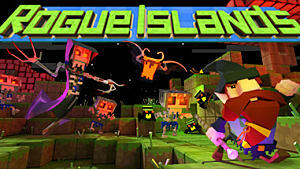 It released on Steam Early Access May 12, and while it is in an early stage of development, Rogue Islands is a competent FPS experience that does its best to break the mold from which so many other FPS roguelikes are cut. You take on the role of a Gnome who is on a journey to save the Deepgrove (The Gnome's Home) from decay caused by the five Lords of Torment. To do this, you must travel the many islands scattered throughout the world, harvesting gems and materials to increase your powers and learn new spells. Only then will you be powerful enough to face the Lords of Torment and restore the Deepgrove to life before it is too late. 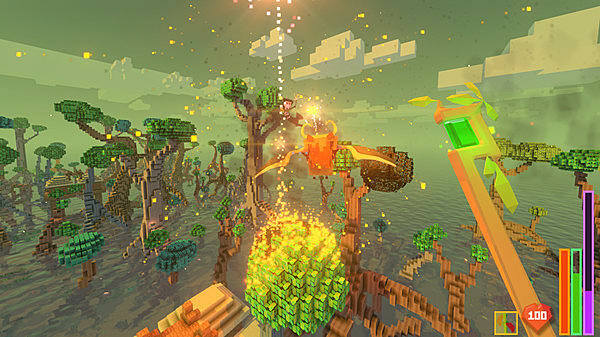 While there is a plot to Rogue Islands it is of secondary focus, while the gameplay is the primary focus in the game. And while the plot is simple, there is plenty of backstory to be had, detailing the history of the Gnome race and its many leaders and factions. These are told as you travel from one island to another during load screens. It gives the plot extra depth, but also makes the story optional, stopping the plot from getting in the way of the gameplay. Overall, the plot of Rogue Islands is a typical one of good verse evil, but both its backstory and history of the Gnomes are rather interesting. The narrative caters to both those looking for a story with detail and those looking for pure gameplay. It's the best of both worlds. That's how you would describe the gameplay of Rogue Islands in three words. 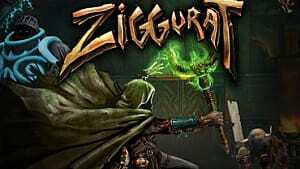 From the Ziggurat perspective, RI has fast-paced FPS and a fairly robust weapons upgrade system; each of the three weapons gives the player new spells to cast when upgraded. Each also requires a specific power for use. For example, the first staff requires mana, which recharges automatically over time, while the other two staves require minerals. This is where the Minecraft aspect of the game comes into play. Throughout each island, you must explore and mine materials such as diamonds, emeralds, and rubies by shooting them with your stave. On top of that, you must collect spirit dust from enemies. Gems are used to upgrade your weapons, each requiring a specific type in order to upgrade. For example, the starting weapon requires an imbued diamond to upgrade, while the second requires imbued emeralds. You obtain imbued gems by combining a whole gem with spirit dust to make it magical and give it the power to improve the effectiveness of your staves. 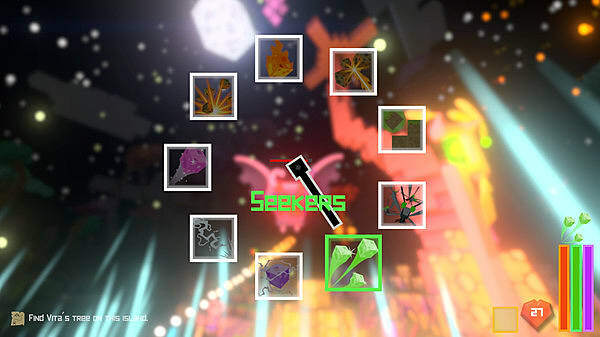 While all this may sound complicated on paper, in-game, it is made simple with an easy to follow crafting screen. And it may seem like the exploring would get in the way of the action, but there are enough enemies to keep you reasonably busy along the way. To replenish your health, you will need to find and eat various foods found throughout the islands. Each type of food works differently and has varying effects on the player. As opposed to instantly restoring your health, it slowly increases as the character digests the food and two foods can be digested at any one time. In the heat of battle, you need to keep avoiding enemy attacks while your health slowly replenishes. It makes the game's combat more about skill and reflexes, not stamina and patience. Of course, being a Roguelike, it also features permadeath, meaning if you die, you'll start over from the beginning. But there is an option when starting a new game that allows for you to have one additional life to better suit those not fond of permadeath. You won't be killing droves upon droves of enemies like in most fast-paced FPS titles, but the game offers a decent balance between its action, crafting, and exploration to keep everyone happy. 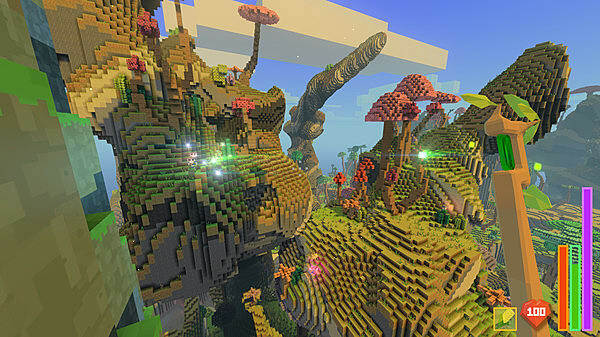 To further solidify the Minecraft influence, the game employs blocky, pixelated graphics and procedurally generated level design. Another of the mechanics of the game is levitation, which allows you to glide distances or slow down your fall. Using levitation uses up your mana, so as you increase your mana pool by mining mana charges, you will be able to levitate for longer and much further distances. It is a handy mechanic that works well, even if it is a bit tricky to get the hang of at first. You can also use your mana and levitation to give your jumps a boost. Just like with the levitation, the more mana you have, the higher you can jump. It becomes extremely useful when needing to climb to lofty areas like mountains and treetops. They are mechanics that make traversing the islands far easier and without them, the game wouldn't be nearly as enjoyable. 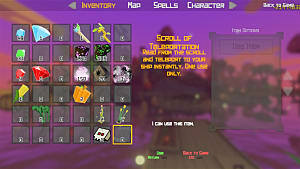 There are also an array of spells to unlock and master as you progress throug the game. Spells come in both defensive and offensive forms. From simple projectiles to lightning bolts to a ball of energy that follows and protects you, there are plenty of varying spells on offer. Each spell handles very differently and the player must learn how to use each effectively. For example, some spells only work when close to enemies, and vice versa. This results in the player having to choose the right spell to suit the current situation, giving the combat a certain tactical feel to it. Even in its early stage of development, there is plenty of content to be found while the mechanics all work well and feel quite polished. 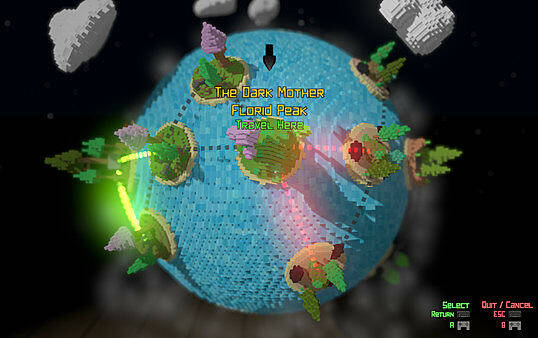 The enemies of Rogue Islands each have their own unique appearance and sets of attack. 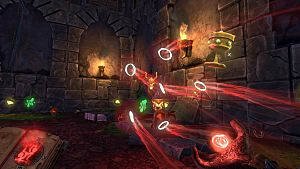 At the beginning of the game, you face off against easier foes, like skeleton gnomes and bloated bees. As you progress, more powerful foes begin to appear, like fire-breathing bats, huge skeleton battlemages, and more. 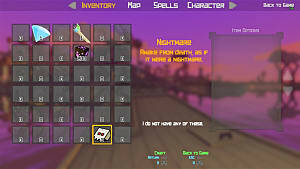 There are also enemies called Ghasts that only appear after midnight. These ghostly creatures descend upon an island at night to drain the life force of Gnomes. They are completely indestructible and should you run into them, your only chance of survival is to flee. The game does feature an array of different enemies, even in early development. They are not particularly interesting to fight, though. Their movements are all very predictable, as are their attacks (each enemy has only one attack). The skeletal battlemages, for example, are the biggest culprit in this regard. While intimidating in size and appearance, I have yet to be hit even once by them. Aside from that one issue, the game is an extremely enjoyable experience and even if they are a bit bland, the enemies do keep you on your toes. I just wish they had a few more attacks to make fighting them slightly more interesting. 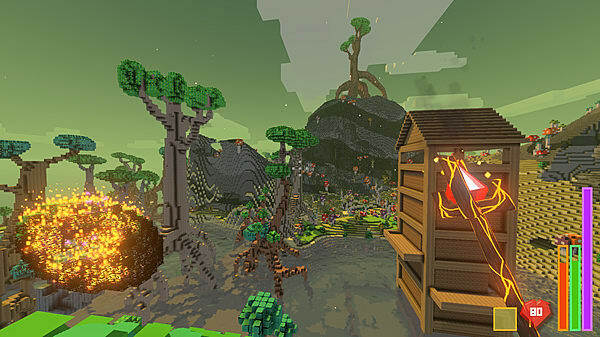 Rogue Islands is a great game and a promising Early Access title. Even in its early stage of development, the game is fully playable and has two of its five bosses currently implemented. 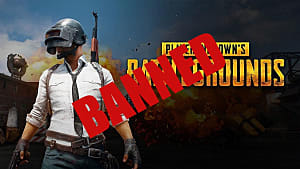 It is an enjoyable experience that caters to a broad audience, offering features and mechanics that would satisfy practically any gamer. The visuals are beautiful and the atmosphere is wonderful with daylight offering a colourful and calm feeling while nightfall brings a sense of dread along with the invincible Ghasts, looking to absorb your very life energy. The developer is aiming to bring mining, exploration, crafting, and fast-paced action together to create a unique experience. And from what I have experienced so far, they are doing a great job doing just that. Disclaimer: A copy of the game was provided to the writer for the purpose of this preview. 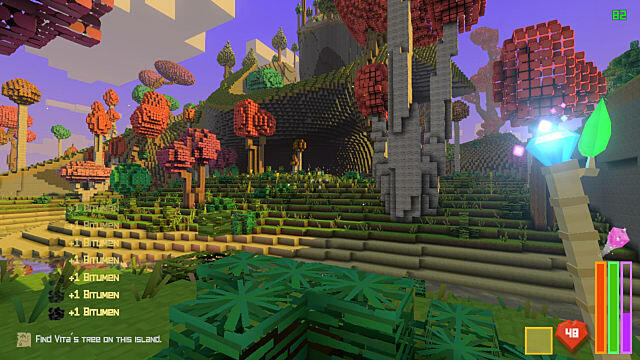 This article is based on an alpha build of Rogue Islands and does not represent a finished or complete product.